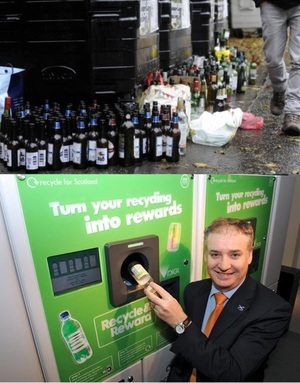 gbRecyle installs smart machines to collect recyclable cans/bottles across communities/college campuses. Putting the recyclables in these machines provide you with feedback on its sustainability impact and refunds the redemption value to your pay pal account. Playing "who recycles the most" with other communities or teams brings an added motivation and bragging rights. Within seconds of inputting your glass bottles, plastic bottles and aluminum cans into the Greenbean machine, you get a real time feedback on the numbers of Kwh of energy that you have saved, have a record of the number of containers you have prevented from entering the landfills and get your 5 cent refund straight into you PayPal account, Student ID cash or as a donation to a charity. 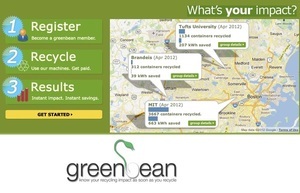 Greenbean allows users to create teams and recycle against each other, participate in recycling challenges and compare each other's or their communities impact with each other in real time.